Stratford-upon-Avon will be full of festivities and entertainment from 23rd – 26th April, as the town celebrates the 451st birthday of its most famous son, William Shakespeare. Stratford’s tradition of the birthday celebrations dates back to 1827, bringing together residents and visitors with people from the worlds of diplomacy, theatre, literature and academia in a vibrant mix of pageantry and performance. Festivities begin on 23rd April at 11am – Shakespeare’s actual birthday, with Coffee, Cake and Sonnets at Holy Trinity Church. Enjoy a slice of birthday cake and a cuppa whilst listening to Shakespeare’s sonnets, performed by the church’s in-house theatre group, Trinity Players. On Friday, 24th April, Dame Harriet Walter will give the Shakespeare Birthday Lecture at the Shakespeare Centre on Henley Street. The event starts at 4pm and is produced by the Shakespeare Institute, the University of Birmingham and the Shakespeare Birthplace Trust. Tickets for the lecture are £10/£8 concession, and can be reserved by calling the Shakespeare Birthplace Trust on 01789 204016. Building on the 2014 launch of Singing Shakespeare – a three year global project to inspire choirs from all over the world to perform new and existing musical settings of Shakespeare, the Shakespeare Birthplace Trust presents the Birthday Celebrations Concert at Stratford Artshouse on Friday, 24th April at 7pm. Shakespeare’s works are being celebrated with a young people’s concert, presenting new material by acclaimed composer, Toby Young and performed by local primary schoolchildren. Tickets are £6 adults/£3 children and available at www.stratfordartshouse.co.uk or call 01789 207100. 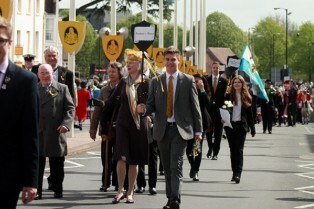 On Saturday, 25th April, the 123rd annual parade will once again be led by students and staff of King Edward VI School. This grand birthday procession will start from the Town Hall at 10.30am, parading through the historic spine of Stratford to symbolise Shakespeare’s life journey from cradle to grave. The parade’s route is being extended this year to include Wood Street, Windsor Street and Henley Street, passing by Shakespeare’s Birthplace on Henley Street and his schoolroom on Church Street, culminating with the laying of flowers by Shakespeare’s grave at Holy Trinity Church. The procession makes a memorable spectacle as it reaches Bridge Street for the ‘Unfurling of the Flags of Nations’ ceremony and the ‘Quill Pageant’. This is where costumed character William Shakespeare will ceremoniously hand over ‘The Quill’ to the head boy at King Edward VI School, signaling the ceremony to unfurl the many international flags that line the parade route. And what good is a birthday party without cake? Shakespeare’s enormous horse-drawn birthday cake, freshly decorated by pupils from the Willows Primary School with the help of artist Barbara Fidoe and Escape Community Arts, will also be parading through town. The ‘icing’ design is inspired by the 600th anniversary of the battle of Agincourt. Everyone will have a chance to enjoy free birthday cake; either by taking part in the shop window cupcake trail or by visiting Stratford College’s stall on Waterside where students will be handing out cupcakes (while stocks last). As well as the birthday parade, residents and visitors can enjoy a fabulous day of free events and entertainment throughout the town centre, jointly organised by the Shakespeare Birthplace Trust and Royal Shakespeare Company. From Samba and Bollywood dancing, to live music, street theatre and acting workshops – there’s plenty of fun for the whole family! 1-2pm: Hall’s Croft Gardens, Old Town – The annual Knights & Nymphs toddler party. Free entry to Hall’s Croft gardens for all families with children under 5. Bring a picnic and enjoy a fun day out with face painting, crafts and lots of fairy fun! Traditional Morris dancing workshops across the town centre, in preparation for the Great Morris Slam at 4.30pm on the Bancroft Gardens. All visiting Morris sides will join forces and dance together. Those tempted to show off their Morris dancing skills can join in the flashmob. 30pm: The Guild Chapel – Singing Shakespeare Concert. London-based choir Khymerikal is presenting a concert of works by British composers, with song settings of Shakespeare’s text, poetry and music inspired by Hamlet and The Tempest. Tickets are £10/£8 concession and can be reserved by calling the Shakespeare Birthplace Trust on 01789 204016. Stratford-upon-Avon residents (CV37 – proof of residency required) can enjoy free entry to all four Shakespeare family homes and gardens, and Harvard House on Saturday, 25th April. In addition to free birthday cake and balloons at all houses, families can enjoy a day of fun activities, including storytelling and Tudor tales at Shakespeare’s Birthplace, or pop in at Harvard House and make a special birthday card for William. The Royal Shakespeare Company (RSC) will offer a range of free activities for the whole family in and around its theatres on Saturday, 25th April, including live music, storytelling sessions, stage fighting workshops and the chance to discover how fake scars and bruises are created. On Sunday, 26th April, the annual Shakespeare Service at Holy Trinity Church will commence at 11am with a special sermon given by The Very Revd Dr David Hoyle, Dean of Bristol Cathedral, and includes music and verse from Shakespeare’s plays, performed by members of the RSC. The Birthday Celebrations will come to an end with a special musical concert on Sunday 26 April at 4pm, organised by the RSC. The Birthday Bash will feature music written for previous RSC productions and the forthcoming summer season, interspersed with speeches and extracts from Shakespeare performed by actors who have a close association with the Company. The winning entry from the RSC’s current Shakespeare’s Birthday Song Competition will get its first public performance at the Bash. Open to professional and amateur composers aged 18+, the RSC is asking for a new musical composition, setting the words from one of Shakespeare’s much loved songs to music. Tickets for the Bash are £16-£35 and available from www.rsc.org.uk or 0844 800 1110. For more information and updates on what’s on during Shakespeare’s birthday weekend, visit www.shakespearescelebrations.com. Henley Street, High Street, Sheep Street and Waterside will remain closed to traffic until 5pm on Saturday, 25th April. Press release jointly issued by the Shakespeare Birthplace Trust, Royal Shakespeare Company, Shakespeare’s Birthday Celebrations (Stratford-upon-Avon Town Council and Stratford-on-Avon District Council), King Edward VI School and Holy Trinity Church.